DOYLESBURG, Pa. — By the time Fannett-Metal Fire Chief Sam Peterson arrived, Our Lady of Refuge Catholic Church was fully engulfed in flames early Sunday. No one was injured in the fire, Peterson said. The call for the fire, at 21169 Cross Road, came in at 3:40 a.m. Sunday, according to Franklin County Emergency Services. Peterson was unsure of the cause of the fire, but said a Pennsylvania State Police fire marshal and officials from the Bureau of Alcohol, Tobacco, Firearms and Explosives were on the scene about 8:15 a.m., when fire units cleared. 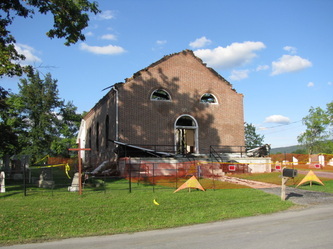 Doylesburg is in a rural area about 50 minutes north of Chambersburg, Pa., and northwest of Shippensburg, Pa.
Peterson came back to the scene to check for hot spots at about 11 a.m. Sunday, where numerous church members were congregating and taking photos of the still-standing brick shell of the building. 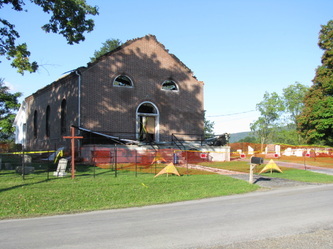 Church member Roseann Miller of Dry Run, Pa., said she heard the news from the congregation’s phone chain alert system. The church, believed to be built in the 1850s, began as a log cabin before the current brick building was erected, Peterson said. 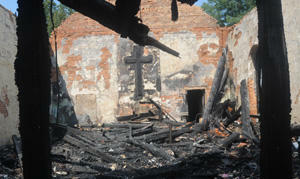 The roof and all the windows of the church were destroyed in the fire, leaving nothing but charred remains inside. 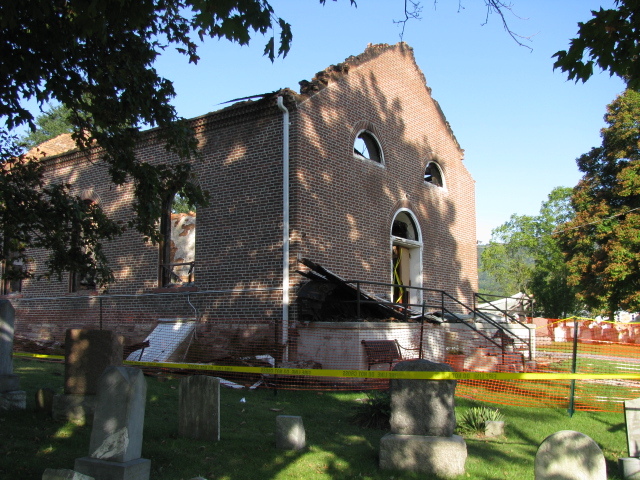 An addition to the rear of the church was relatively unharmed, but there were plans to renovate it in the near future, said church member Barb Goshorn of Spring Run, Pa. 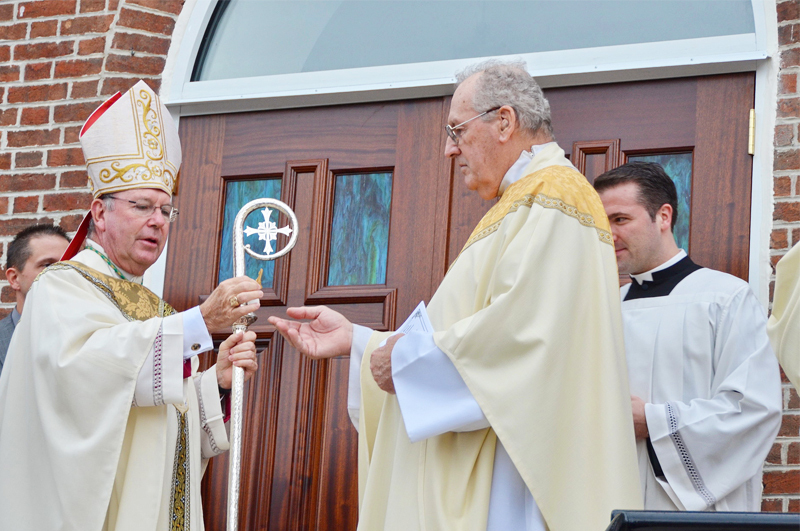 The church held a service Saturday at 7 p.m., but Goshorn and others said nothing seemed out of the ordinary as they left. Ed and Rosann O’Lone of Delaware County, Pa., were visiting relatives and attended the service. Rosann O’Lone said she remembered church officials blowing out candles when they left. “It’s so sad,” she said looking at the aftermath Sunday. Peterson said it was very foggy when the first fire units arrived on the scene. The blaze was brought under control quickly with the help of a ladder truck from MMP&W Fire Department of Mercersburg, Pa., he said. The church, which is affiliated with Corpus Christi Catholic Church in Chambersburg, was home to about 25 active families, Miller estimated. The Rev. James R. O’Brien presides over the church, she said. Phone calls to Corpus Christi officials went unanswered Sunday afternoon. A neighbor reported the fire, Peterson said. Additional information from state police was not available Sunday night. 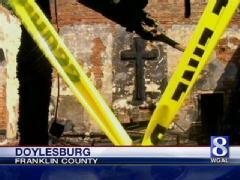 DOYLESBURG -- Parishioners are looking for a place to conduct services after an early-morning fire Sunday at a Doylesburg church. 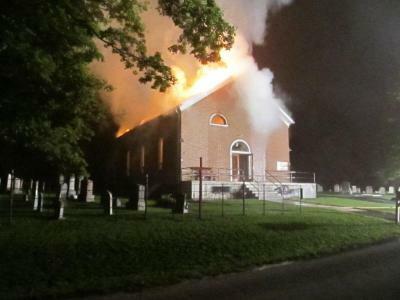 Fannett-Metal Fire Department Chief Sam Peterson said the call came in at 3:39 a.m. and Our Lady of Refuge Catholic Church was fully involved by the time first responders arrived. 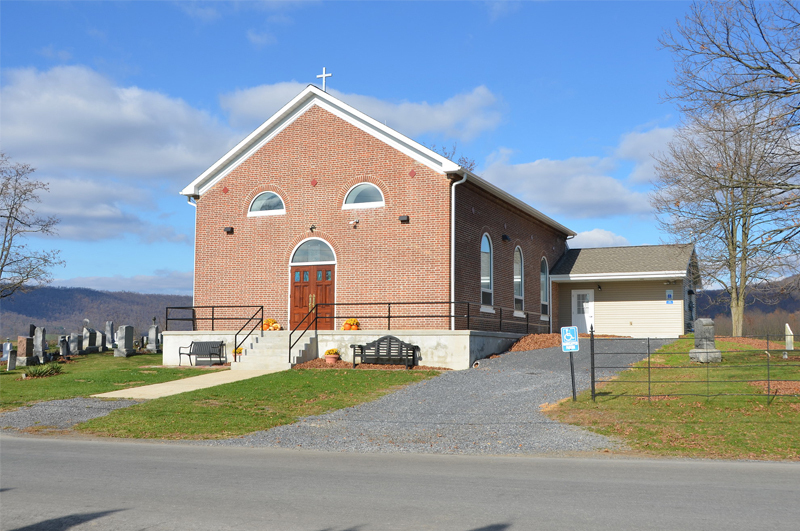 "We'll have Mass in a pavilion across the street Saturday," said Father James O'Brien of Corpus Christi Catholic Church, Chambersburg. "Parishioners are starting to look for an alternate space -- either a community building or a church to use on Saturday night with another group not having service at that time. 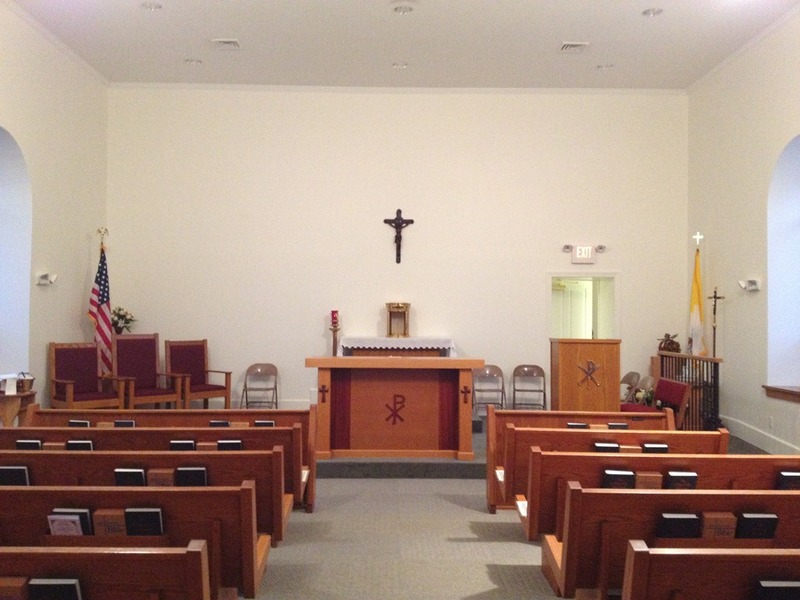 "The next step is to meet with the diocese (of Harrisburg). Ultimately, it's their responsibility to plan for a replacement and what we'll do moving ahead." Our Lady of Refuge is a mission church of Corpus Christi. 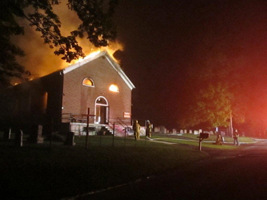 Pennsylvania State Police Fire Marshal Jeffrey Sarver said Monday that the fire at the church "doesn't appear to be suspicious, but we haven't ruled it out." Sarver said the blaze remains under investigation and a cause has not been determined. Fire departments from six counties assisted, Peterson said, with 50 to 75 firefighters working the scene. 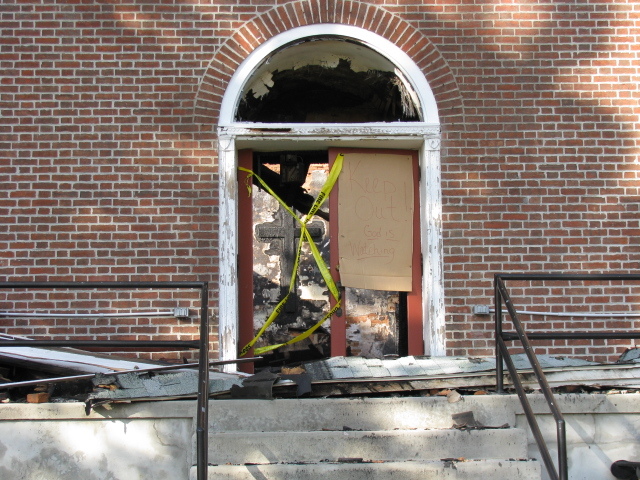 Fannett-Metal cleared the scene at 8:17 a.m.
Parishioners say Mass at Our Lady of Refuge once per week -- 7 p.m. on Saturdays during the summer months and 8:30 a.m. on Sundays beginning in October, O'Brien said. 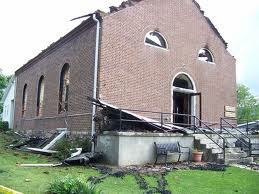 The church serves Path Valley and approximately covers the region of Fannett-Metal School District. DOYLESBURG, Pa. — The cause of a fire that destroyed Our Lady of Refuge Catholic Church will be listed as undetermined, Fire Marshal Jeff Sarver of the Pennsylvania State Police said Tuesday. 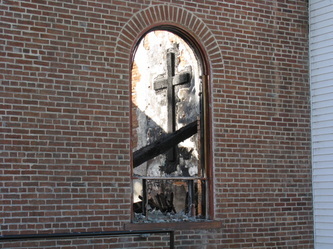 Fire ripped through the church, believed to be built in the 1850s, early Sunday. Sarver said he believes the fire started in the church’s electrical system, but the extent of the damage made it impossible to pinpoint where. “They were having Mass the night before. They reported the lights were blinking, but they didn’t think anything of it,” Sarver said. There were no signs of a break-in or anything taken from the church safe, according to Sarver. “There’s nothing suspicious we’re seeing,” he said. 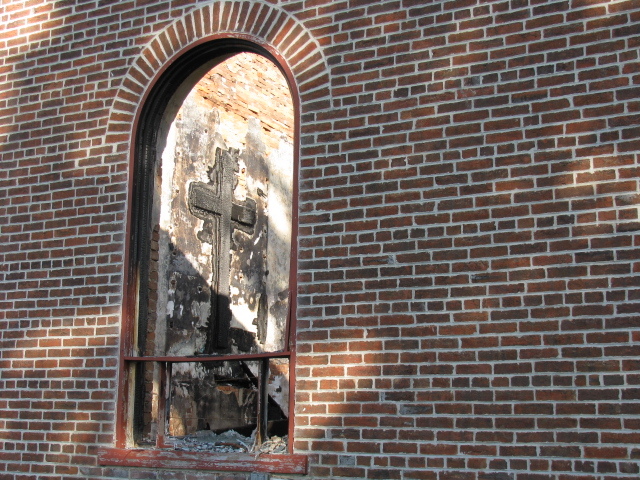 The roof and all the windows of the 21169 Cross Road church were destroyed in the fire, leaving nothing but charred remains inside. On Sept. 11, 2011, Karen Gipe watched in horror as Our Lady of Refuge Church in Doylesburg burned in a destructive fire, leaving only its brick structure behind. 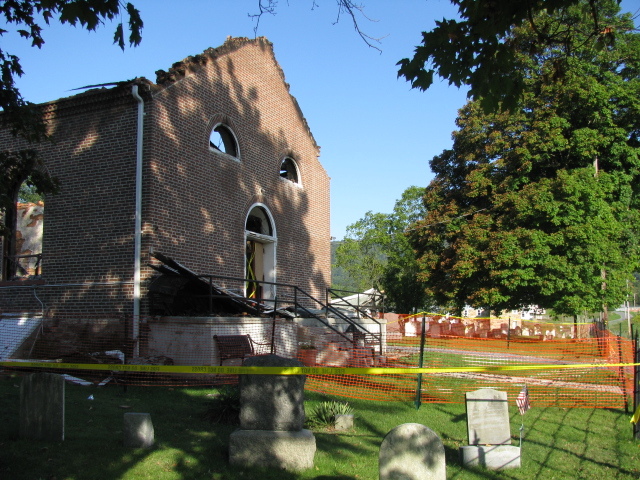 Awakened by the terrible news of the fire in the middle of the night, Mrs. Gipe had rushed the two miles from her house to the beloved historic church. She arrived in time to watch the roof collapse. For parishioners, the past year had been a long one, filled with grief over the loss, uncertainty about whether the church – a mission of Corpus Christi Parish in Chambersburg – would be rebuilt, and then waiting with anticipation as the reconstruction project moved forward. The strength and faith of the parish community were among the focuses of Bishop McFadden’s homily during the dedication Mass. 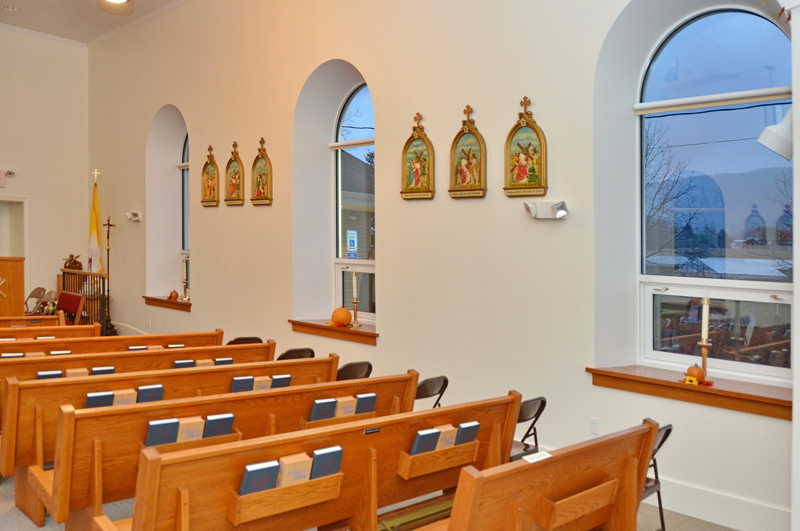 “In coming into this Church of Our Lady of Refuge, it’s important to understand that this building – as nice and as beautiful as it is – is really not the Church. This building, these walls, are not the Church of Our Lady of Refuge. 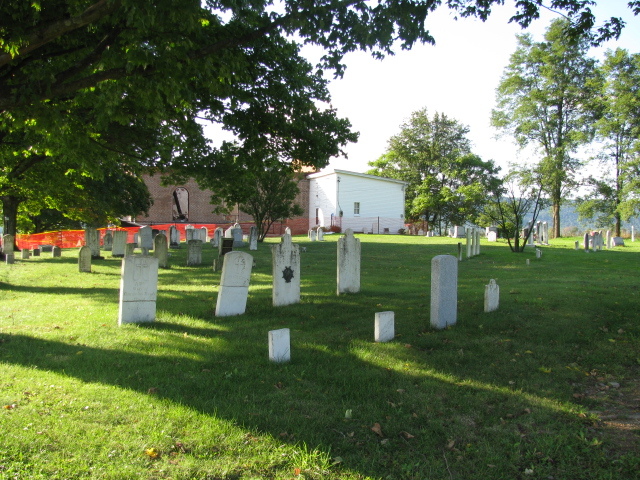 Catholicism in Path Valley dates back to 1737, when Thomas Doyle, a Catholic, received 530 acres of land there. The first Mass was celebrated in a local home in 1790. 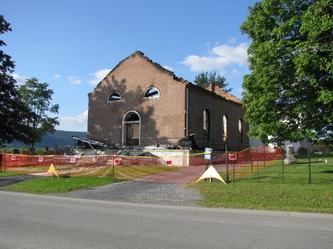 A log chapel that the Doyle family built next to the family cemetery in 1802 eventually became the first church. The second church was dedicated in November 1853. The current church is a symbolic connection between the old and the new. 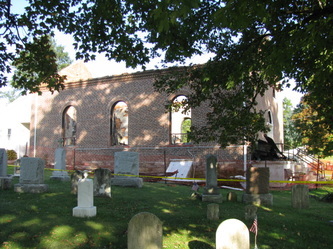 The brick shell from the second church remains. While floors, walls, roofing, windows, plumbing and electrical wiring are new, the re-built church includes pews from a church closed in Pottsville, Pa. And, enclosed beneath the concrete foundation is the former tabernacle, a cross and other items from the previous church.